Few pieces of furniture design straddle rustic rural living and clean contemporary environments as well as our adaptable Portobello Range. We’ve thrown every type of setting at this chic simplistic range and it comes up trumps every time! So this week, we’ve dissected some of our key Portobello looks, room by room, to showcase why we think this range is a modern country classic. 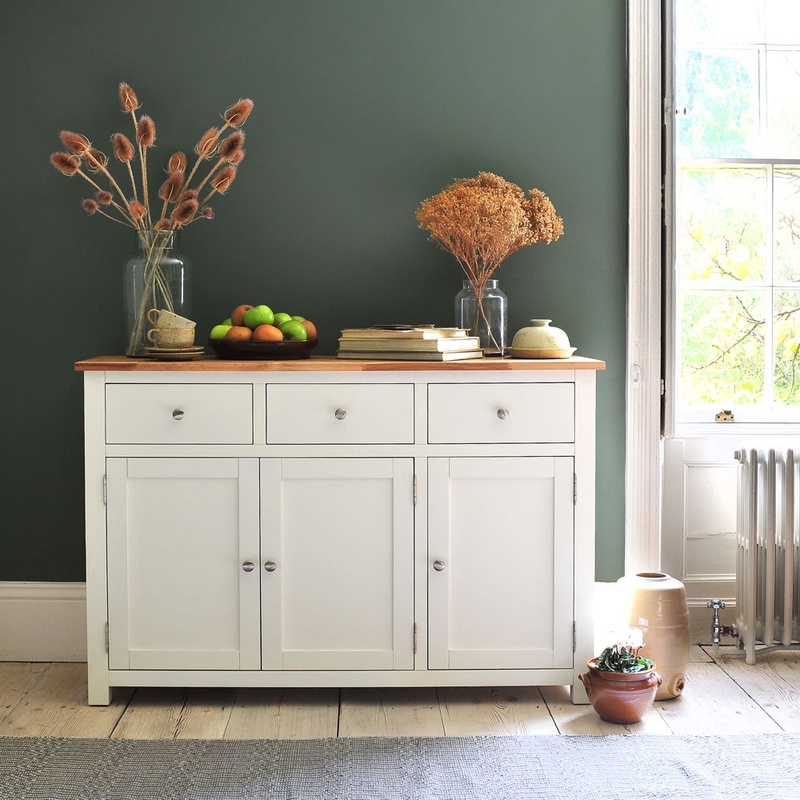 This range is reassuringly solid; built with a strong and chunky composite wood with a thick durable coating of smooth cream paint. It’s perfect for high usage areas such as the bedroom; this sturdily constructed bed frame offers you a wobble-free and continuously comfortable nights sleep every time. 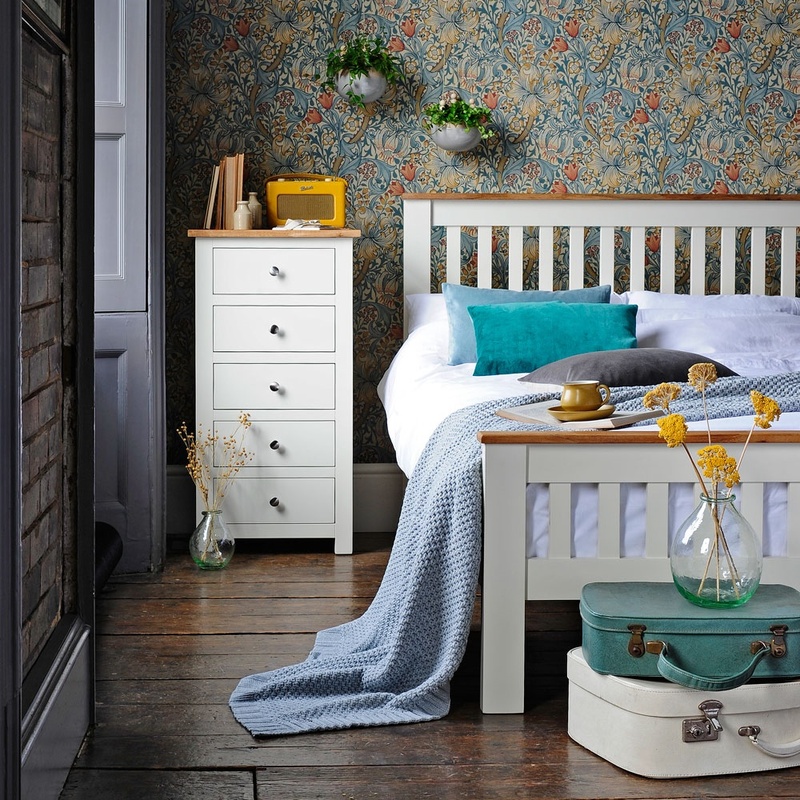 Portobello works perfectly in rooms where you want to play with splashes of colour and texture. Even with the backdrop of this busy William Morris print wallpaper and velvet turquoise cushions the room still feels calm and restful thanks to the Portobello finish. The range also works beautifully with worn, rustic textures, acting as a counterbalance and lifting the rugged surfaces around it. 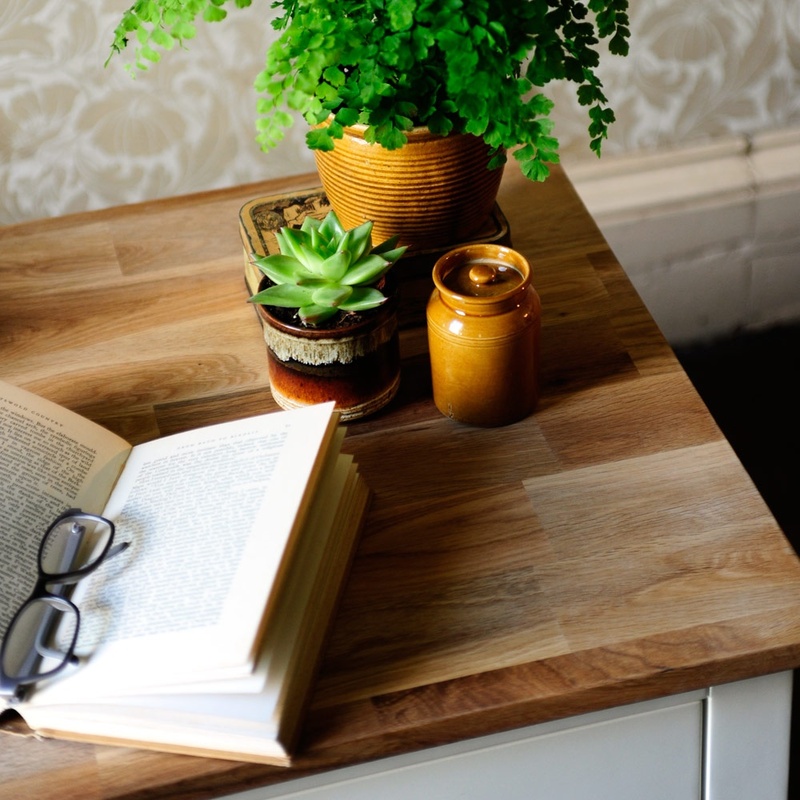 The presence of Portobello in an unpolished, simplistic environment like this one, can instantly make the whole room feel clean and contemporary. 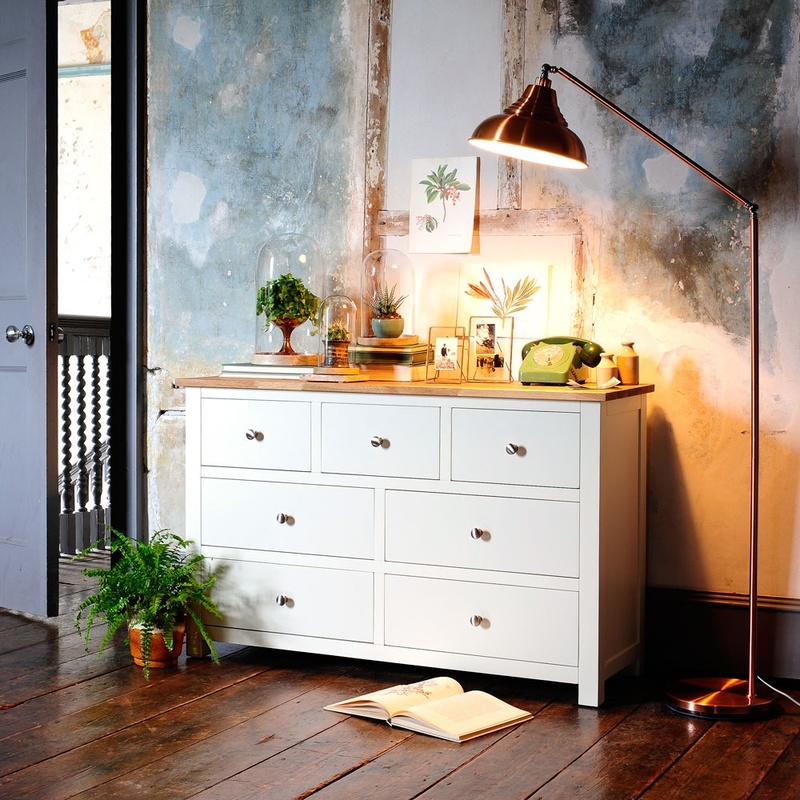 We’ve teamed our Portobello Chest with the striking copper Robinson Floor Lamp. It provides a fabulous contrast to the cream surface and chrome handles and illuminates the oak surface beautifully. Visit our Stow store if you’re interested in the cloches featured in this shot. 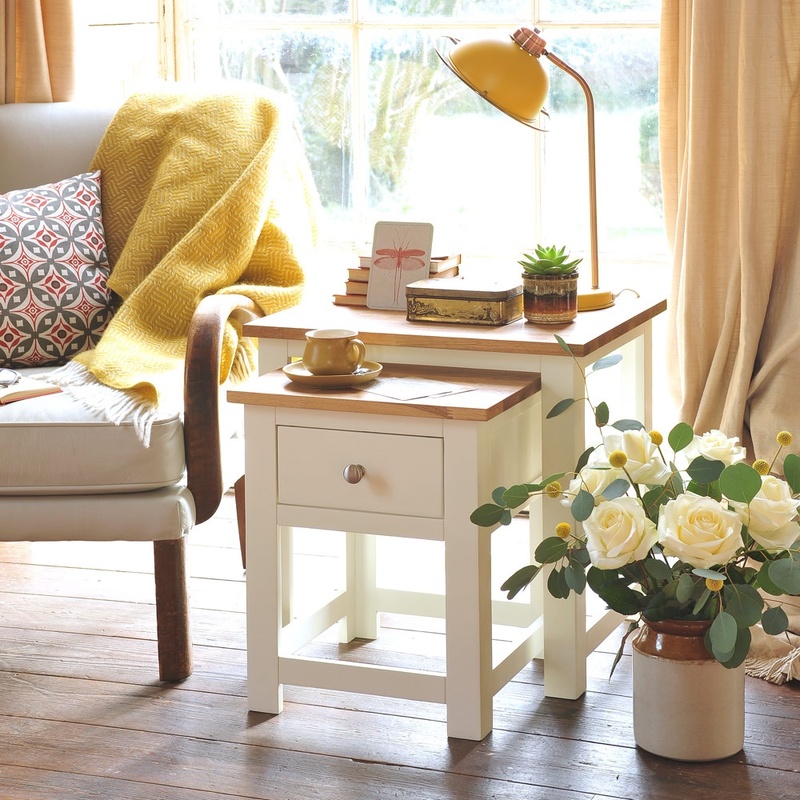 We have a small capsule collection of living room furniture in the Portobello Range, from coffee tables to TV units and lamp tables. Each piece is complemented with a durable oak surface that strikes the perfect balance of warmth with the cool cream painted surface. We’ve drawn from the yellow tones of the oak and teamed this coffee table with a rust and ochre throw, a vintage armchair and a group of mustard pots. 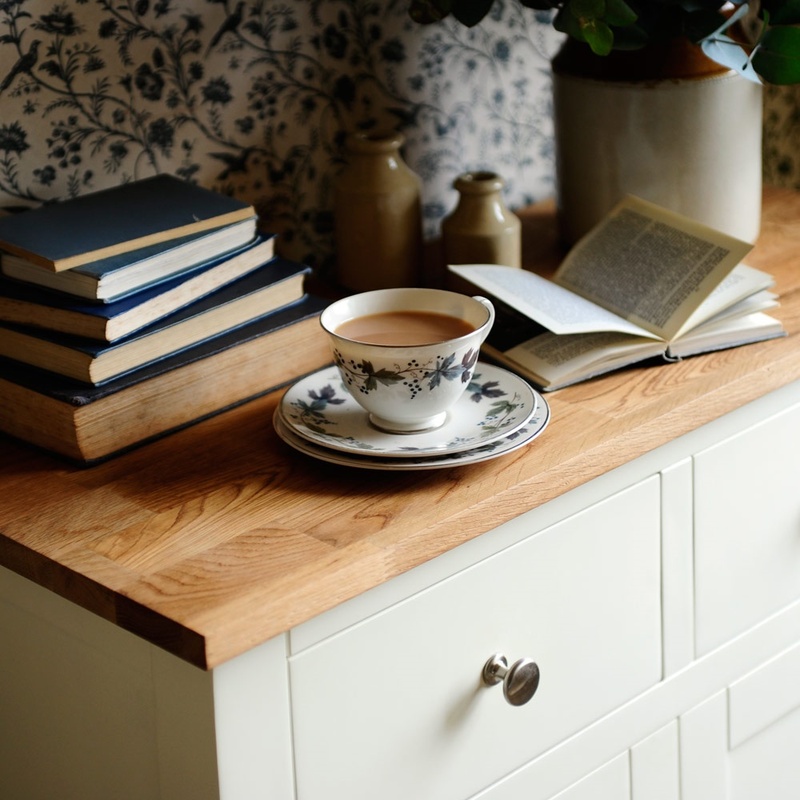 Introducing the combination of painted furniture with an oak surface is a great way of instantly achieving that classic country look. The Portobello range gives you the opportunity to dip your toe into ‘country interiors’ water but offers a contemporary twist, so even if you’re living in the city, this range can bridge the gap between rural and urban living. Our Cream and Copper Tamra Floor Lamp works particularly well with the milky tones of our Portobello paintwork. We also thought it worked wonderfully with this intricate vintage Laura Ashley wallpaper and antique tea set. 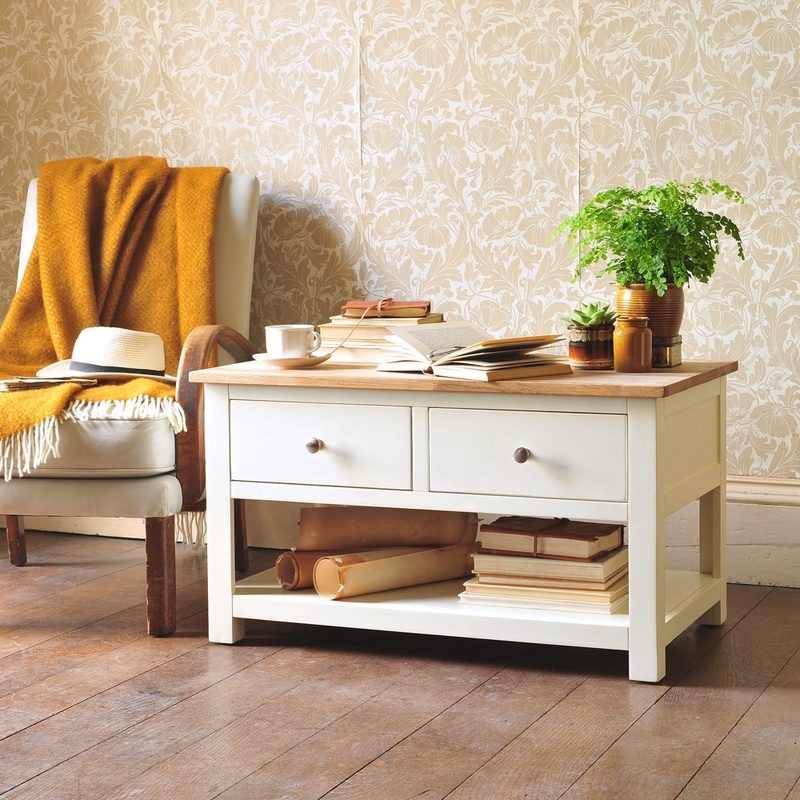 It’s an eclectic mix of styles but this understated range can tie together a multitude of interior genres. 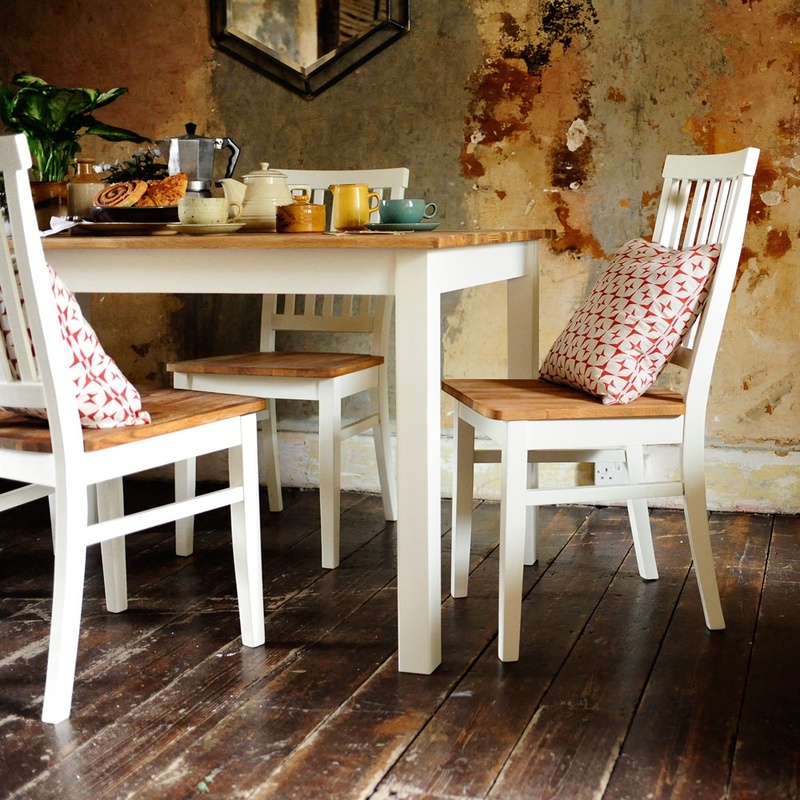 This simple and chic dining set is great looking and one of our best in terms of value for money. You can make amazing savings when you group your table and chairs together as a set and our Portobello style is no exception. 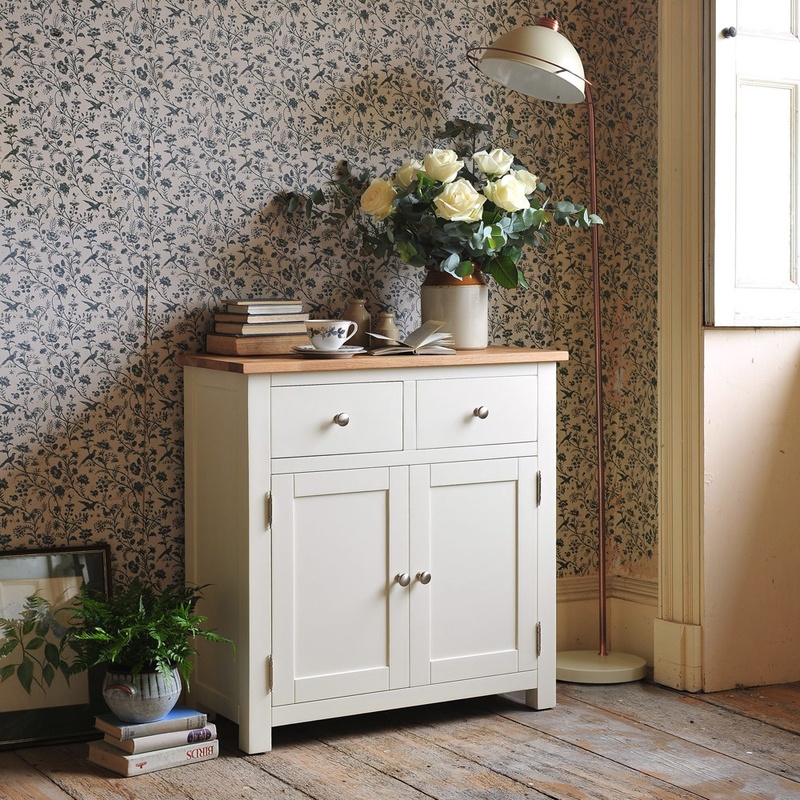 Team it with one of the small or large Portobello sideboards and you’ve got a beautifully coherent dining look without breaking the bank. 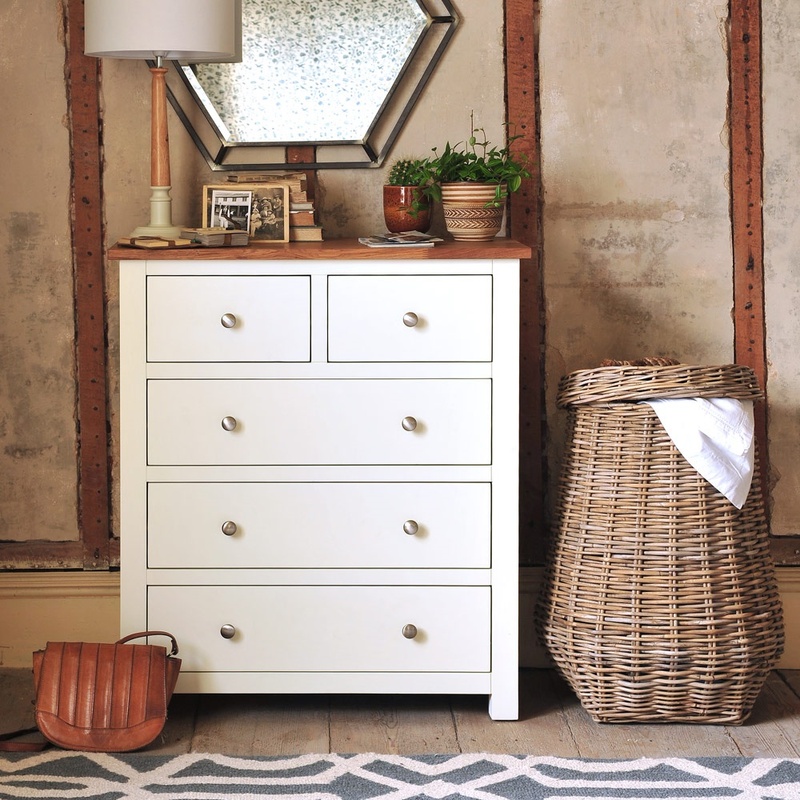 To view even more styles in this range, have a browse through the full Portobello Painted collection on the Cotswold Co website.